My friend Amanda and I used our session at the 2007 DMA Annual where we spoke on next generation web strategies as an excuse for another yarn adventure. Since Amanda had presented over the weekend, she had spent Monday indulging in some shopping therapy (aka exploring Chicago) where she scoped out a couple of yarn stores. At the recommendation of the manager at Chix With Stix and its close proximity to my hotel, we decided to visit Loopy Yarns. Its name is a great play on its location in Chicago’s loop and the fact that knitting (or crocheting for that matter) consists of loops. The store is a surprise find near Columbia College. The long narrow store has one of the most interesting collections of fibers that I’ve seen! Among the unusual ones are hemp, something my boyfriend and I have been trying to locate for a while, and corn. In addition, there are a lot of fibers from small producers ssuch as women’s collectives so that you feel good about buying them. Further, there are knitted swatches of the fibers so that you can see how it will look when you use it. Close up of Loopy’s yarns in Chicago’s Loop. Amanda settled in near the patterns. Lately, she has been taken with beading and is always on the look out for another pocketbook challenge. 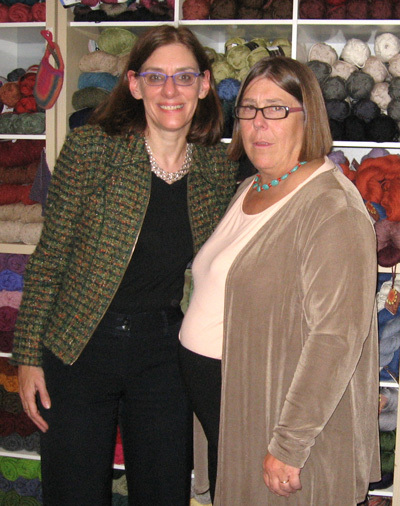 Heidi Cohen and Amanda Watlington at Loopy buying more yarn! Midway through the store, I discovered the hemp which is similar to linen and knew what I was purchasing. After purusing the rest of the treasures, I went to their book section which unfortunately lacked the Knitted Lingerie book. I used the Mason Dixon knits as a backup. When I settled into the knitting table in the back, one of the women from the store was very helpful. She not only gave me some advise for my Origami Sweater. While Loopy carried several patterns for hemp that would have fit the type of lacey garment I was looking to make, they all used a thicker yarn. Since the clerk knew the Knitted Lingerie book, she took me to the store’s computer which we used to see what other knitters were using for the patterns! 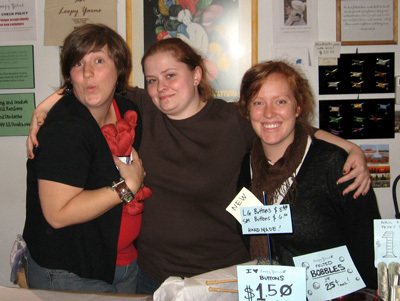 Here’s a photo of Loopy’s very helpful staff who made me feel extremely welcome. Even better was the fact that they were excited to see the photos from our engagement celebration at The Point! They felt disappointed that no one had considered a similar event at Loopy. Hopefully, some newly engaged knitter will! Thank you for all your kind words about my staff and store. 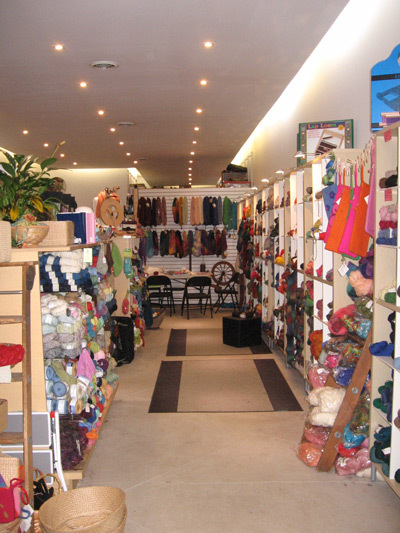 We loved having you at Loopy Yarns. 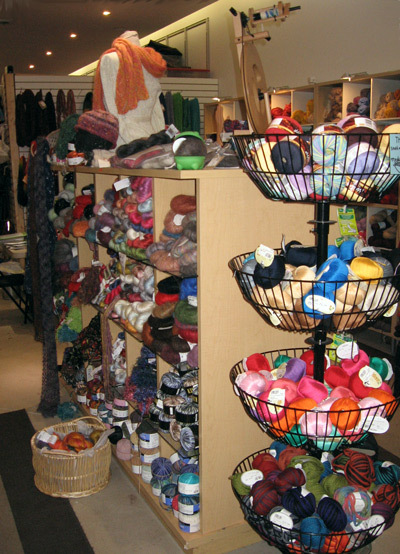 We have worked hard to have a broad and unusual selection of yarns for our great customers. We also have a lot of fun (part of the loopy designation). We’re looking forward to seeing you again soon!